This action RPG depicts a never-ending war between an evil sorceress named Mormo and the bearers of a mystical sword called Ditto. At some point, Mormo was able to use her dark magic to seize control of a charming little island. Her minions roamed the countryside uncontested while the more peaceful inhabitants were pushed to the edges of civilization. To challenge her reign, a nameless hero was granted the Sword of Ditto. Using its power, the hero were able to banish Mormo, ushering in a time of peace; the absence of her dark magic forced the monsters to retreat into the shadows. While this was a great victory , her banishment wasn’t permanent. A century later, Mormo would again attempt to rule the land, prompting another hero to wield the Sword of Ditto. The game begins with the latest hero being approached by a spirit guide (who resembles a giant beetle). This odd character informs them that they’ve been chosen to wield the sword and save the world from Mormo. Acting as a tutorial of sorts, the hero will fight their way up her tower only to be killed moments into the confrontation. This plunges the world into darkness. One hundred years later, another nameless protagonist is approached by the spirit guide. Only this time he or she is given four days to prepare for the coming battle. From here it’s up to the player to decide where to go and what to do. The basic mechanics are familiar. 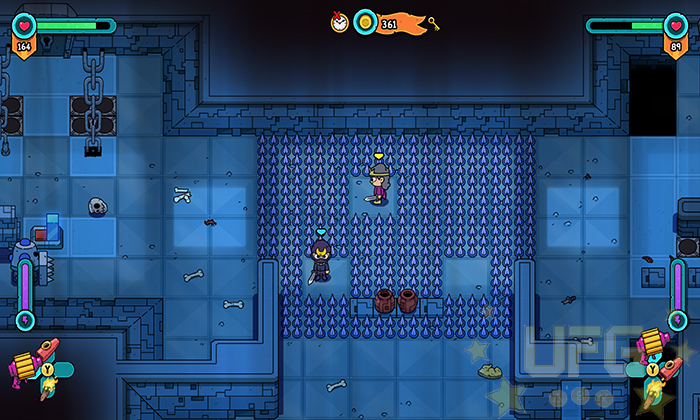 Players will battle monsters, search through dungeons, and solve puzzles using recently acquired weapons/tools. 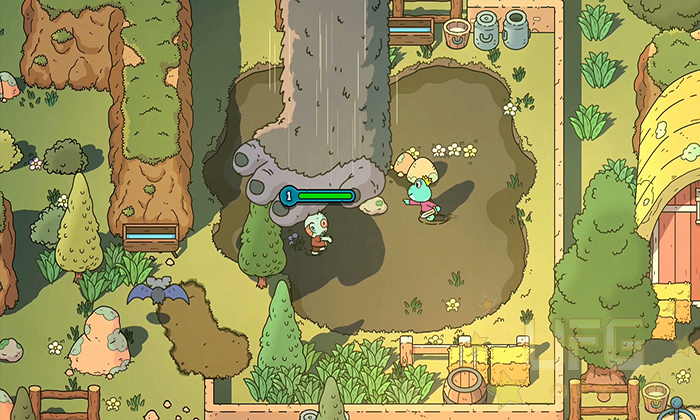 All of this is viewed from a top down perspective, complete with the transitioning landscapes that reveal new areas when the player reaches the edge of the screen. That much alone provides decent entertainment. To add some flavor to the proceedings, Onebitbeyond introduces a few rouge-like elements. One of which being the time restraint; with only four days to prepare, its impossible to complete every major objective before the “final” showdown. For instance, it would be ideal for players to seek out Mormo’s Anchors – two large, stone relics that boost her strength – as destroying them will make defeating her that much easier. 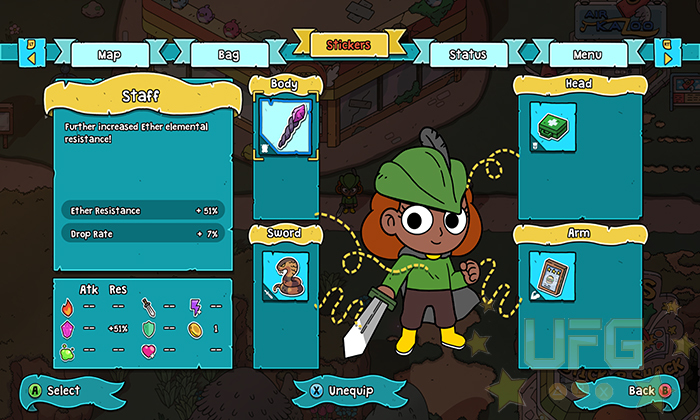 This requires the player to locate and explore mini-dungeons in search of toys (special tools) before heading to a larger dungeon housing an anchor. Though the locations will be marked on the map, it’ll still take some time to traverse the maze-like environments to reach the dungeons. Heck, just getting into them can eat up minutes as most require the Sword of Ditto to reach a certain level before the doors will open. The only way to raise its level is by defeating monsters. Side-quests that grant money to buy items or stickers that provide buffs can help in this endeavor. Completing them will take time though. It is possible to fast travel but the interdimensional bus stations, though well placed, aren’t always close to a point of interest. What’ll probably happen is that time will run out, forcing the player to face Mormo prematurely. They’ll then die and plunge the planet into darkness for a hundred years. At least, that’s what happened to me. If you haven’t guessed, death is permanent. One wrong move and it’s another century of turmoil. The game will continue of course, but with another hero. The world around you will have changed to reflect what happen prior. Success brings about a long-lasting peace. New NPC’s will show up, houses will be built beyond the main town and more. Failure results in the opposite; dilapidated buildings, gloomy residents, less side-quests. Regardless of how well you do though, you will always make progress. Some of that progress will be personal; you’ll learn how to deal with certain enemies or how to better solve puzzles. This will eventually lead to new discoveries; like a “secret” character who can turn back time in exchange for gems. All of it is by design. The currency needed to rewind time only becomes available after you’ve spent some time adventuring. New foes will seemingly appear only after you’ve killed a certain number of the weaker enemies. The other way you’ll progress with each victory and defeat is through the Sword of Ditto. This is because it retains the experience earned by the previous heroes. This doesn’t necessarily make fights easier because of how the leveling works after death – if you start a new game at level 6, the enemies will be at level 7. That said, it does offer new perks. In early playthroughs, you’ll only be able to equip a few stickers to certain parts of your body for example. After hitting a certain level, more slots will be made available. I also noticed other changes like a larger pool of health and less difficulty finding loot. As it stands, The Swords of Ditto is rather fun. My only concern was with a misplaced mechanic. Every time you enter a dungeon, a random modifier will change the game’s rules. This ranges from allowing physical attacks to do more damage to disabling your stickers. The problem is that this mechanic ruins the otherwise promoted, progressive gameplay. When the rules are changed in your favor, it effectively removes the challenge. On the other hand, when the rules are against you, it voids carefully laid plans. I had a really good run right before writing this review. Both of the anchors had been destroyed, I rewound time in order to find and equip decent stickers and I had plenty of healing items. It was time to face Mormo. Unfortunately, as soon as I stepped into her tower (which acts like a dungeon) I was told that all of my stickers were disabled and that the enemies’ abilities would be stronger than usual. That was the first time where I felt that the game was being unfair. I worked hard to be fully prepared for this fight – like the game told me to do – only for it not to count in the end. I mean, I was still able to defeat her. I just didn’t enjoy doing it; I would have rather the challenge come from a difficult fight, forcing me to burn through my items while utilizing my stickers. Beyond that, I believe Onebitbeyond did a decent job of balancing The Sword of Ditto’s assorted gameplay mechanics. The similarities to The Legend of Zelda are certainly welcome; I enjoyed the simple combat and clever puzzles. The dungeon crawling was made more fun given the drop-in/out cooperative play and whacky toys; vinyl records that ricochet off walls and what I can only describe as King Kong’s foot, to name a couple interesting ones. That said, it’s the gradual unravelling of Ditto’s world that the most intriguing. There are many secrets (including the reason Mormo doesn’t stay banished), hidden characters, lore and more that is revealed the further down the rabbit hole you go. The result is a modest, yet engaging experience that gets better over time. 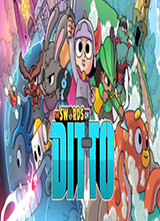 The Swords of Ditto is an engaging, action RPG that’s reminiscent of classic titles like The Legend of Zelda. 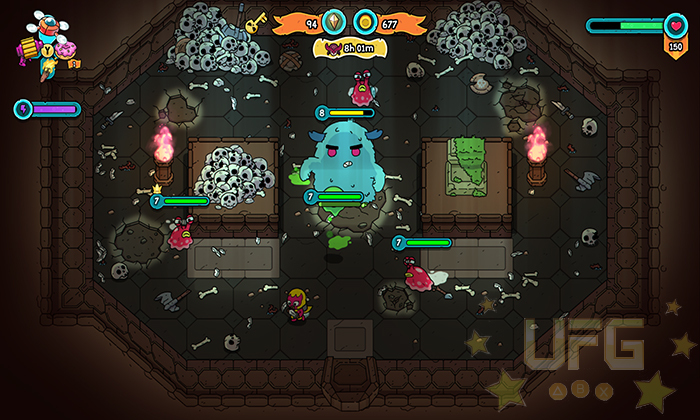 It features a hodgepodge of elements, that only falters when it comes to the game’s dungeons. I love the charming, cartoon like aesthetics. The music adds to the charm. The game is all about replaying, as success or failure brings about a new hero and map to explore. It’ll take time before players discover how to fully banish Mormo for good.